Branding 101: A Quick Guide for Beginners - Powered by technology, our unique program uses software and algorithms to conduct a custom online competitive edge! Your business is only as good as people think it is. It's not enough to just have a website. You need to establish yourself and stand out from the rest of your industry. To succeed in the online world, you need to know what you are and let everyone else know it too. Knowing that can be tough, though. Your company has to ask itself many tough questions. What are you right now, and what do you want to be? What makes you different. But the rewards from answering these make it worthwhile. 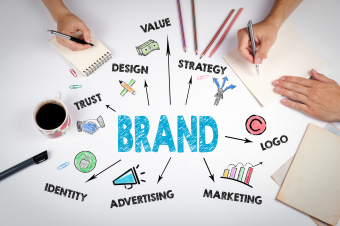 So here is your branding 101 guide to help you get established in your industry. Think of your best friend. Describe them to yourself. At first, you may start muttering adjectives like, "funny," or, "smart." Then you may start thinking of stories about them, ones which truly showed you who they are. Now do the same for your company. It's the same process. Before you can ever convince people you're different from the crowd, you need to know how first. Your brand should originate from genuine introspection about what your company is. By reflecting on your company, you'll be able to describe it beyond what it does. You'll be able to say what it is. This is more than branding 101, it's psychology 101. It's a process of figuring yourself out. You may have thought of some stories from the office when you described the company to yourself. Maybe the thing you remembered was a funny joke a coworker told. You might have thought of a time when the company struggled, but persevered. To establish your brand, tell those stories to other people. Don't just explain the story like you would for your boss. Give it emotion, tell it passionately. If you thought about the time someone told a funny joke, your brand could tell people how the company is family. If you thought of a story from when the company struggled, let your brand reflect the company's strength. Let it reflect the company's commitment to succeed in the industry and for the customer. By now, you should know the stories you want to tell and the adjectives describing your company. The final step is to know who to tell those things to. First, you need to understand your market. Find out what customers need and have your brand reflect. Then, understand your audience. Chances are, you may not be able to attract the whole market. People are different from one another - they're not all after the same thing. Figure out why people come to you instead of your competition, and flesh that out. After that, you will have your first well-established brand. Not just a company. Branding your company isn't hard. It's a part of your company growing up - when it needs to find an identity for yourself. That means it needs to first describe itself, then tell stories about how it stands out. Finally, it'll be able to understand how it fits into the industry. Like growing up though, it can be a hard process. Branding 101 may sound like an easy class to pass, but it's tough in practice. That's why it helps to have someone walk you through it. Contact us, and your company will understand itself about as well as its new customers will!